Why Switch to Metal Roofing and Cladding? The benefits of making the move to a long lasting, beautiful, tough and sensible solution to traditional metal roofing and siding materials are obvious! The Quality of Your Investment! Metal roofing from Domtek is guaranteed for 40 years. So forget about having to re-roof for a very long time. 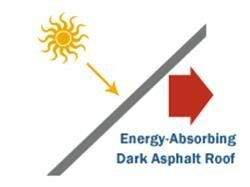 The average home owner with a typical asphalt roof will replace their roof on average every 10 to 20 years. Sometimes sooner, depending on the pitch of the roof, shingle colour and climate that the roof is exposed to. When asphalt roofs are installed on your home or business, they begin to deteriorate and lose value. With Domtek’s wide variety of durable panel profiles, your new roof or wall cladding maintains its value and in most cases helps to improve the value of your property. With the removal of your old asphalt shingles reaching as high as $100 to $150 per square foot, you will be glad to know that Domtek metal roofing is able to be installed right on top of your existing roof! Saving you time and money on labour for the removal of old shingles and hauling them to your local landfill. If you’re worried about the stability of your structure you can rest assured metal roofing is the right choice. Metal roofing is one of the strongest, lightweight materials available on the market. Metal roofing weighs less than half the weight of asphalt shingles and can support greater snow loads, protecting your family and your home in any season. Unlike traditional roofing products, with metal you don’t have to worry about costly repairs after a rain storm, heavy snowfall or hail. 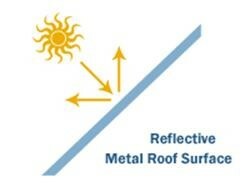 Metal roofing and wall cladding has superior debris, water and snow shedding ability compared to traditional materials. Domtek’s metal roofing is non-combustible. Formed from Hi-Tensile metal, it will not burn – unlike traditional asphalt shingles, cedar or pine shakes that do! After all, what’s more important than the safety of your family! Tired of worrying about your roof during a storm? When metal roofing or cladding is properly installed, it’s able to withstand some of the harshest winds our Canadian weather has to offer. It has been seen to withstand winds over 200 km/h! Be cooler in the summer. Because metal roofing and wall cladding acts as a radiant barrier, it helps to reduce the heat load on your building saving you money on cooling costs. Save the Environment! Help to Reduce Landfill! It can be 100% recycled at the end of its life. You can see why Domtek’s metal roofing and cladding is the best alternative for traditional roofing and siding materials. If you have any further questions or information requests, please feel free to contact us. *Abnormal atmospheric conditions to which this warranty does not apply include but are not limited to hail, exposure to corrosive or harmful chemicals (whether solids, liquids or gases), airborne contaminants or other abnormal conditions. The warranty does not cover damage caused by acts of God, falling objects, or dissimilar occurrences beyond our control.